Article 9: The Egypt 1959 Definitives This issue depicts a mixture of political propaganda, idealized portraits, antiquities, industrial progress, and export themes. 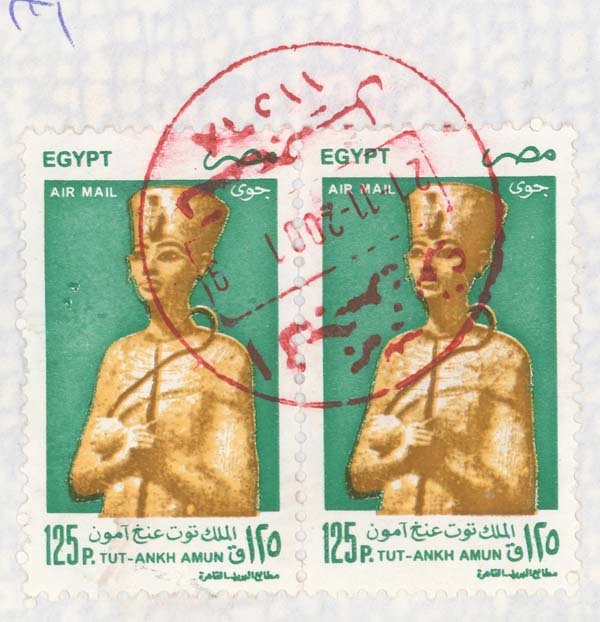 Article 17: The Egypt 1964 Definitives The Egypt 1964 definitive issue shows a good run of designs from Ancient Egypt as well as more modern cultural themes.This article includes a page with some printing shades. Article 33: Egypt 1964 High Value CTO Blocks Here are CTO (cancelled-to-order) blocks of six for the three high values of the Egypt 1964 definitives. I include links to the blocks of the 100m, 200m, and 500m. I also include a page with high resolution images of the figures. Article 100: Egypt Modern Blocks; Nubia issue etc Here is a selection of Egypt stamps from the 1960s. In this page I show a random sample. Quick links are for the main page and a page dedicated to two issues for the preservation of Nubia's temples. Article 127: Egypt Monuments Commemoratives Here is a selection of monuments commemoratives: Save Abu Simbel and Monuments of Nubia. Article 371: A few Egypt covers Here is a small selection of covers to Iowa, USA.